Usually, we expect the photo to tell a story, a good image is worth 1,000 words. The set up for the photo. A family party, my 81 year old Mom, my brother and his wife from Virginia unable to make the trip. The computer placed right on the kitchen counter, in the middle of the food, the middle of 28 family members walking through the kitchen, stopping to chat or make a comment, just as we would do if Jeff and Barb were in the room. We were using a freeInternet telephone service called SKYPE, well, free between Skype to Skype. There is a fee if you Skype to a landline or cell phone, but that information is listed on the SKYPE information page. 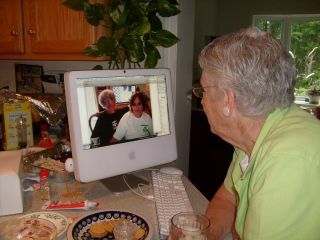 I am hearing more and more from grandparents who have set up SKYPE on their home computers, so they can see and talk to their grandchildren, each week. I am reminded of purpose. If you had mentioned to those grandparents that they could be in touch with their children, friends or neighbors who have moved away I don't think that would have been enough of a compelling reason to learn something new. However, with the birth of a new grandbaby, time and distance have proven to be overshadowed by a new technology and have given purpose to reach out and see someone. We use SKYPE at our school to allow community members access to committee meetings. We SKYPE students, who are medically challenged, into their classes. We could SKYPE guest speakers into our classrooms, we could SKYPE grandparents in to visit classes on Bring a Grandparent to School Day. We have the technology, now we need the compelling reason for change. Leave an idea for how you have used video conferencing in your classroom. Google Video you will need a google account for this.